One aspect of the coming of the Messiah is curiously absent from most forms of Christian eschatology. What did the generations of Noah, Nineveh, and Sodom and Gomorrah share in common with the apostles? 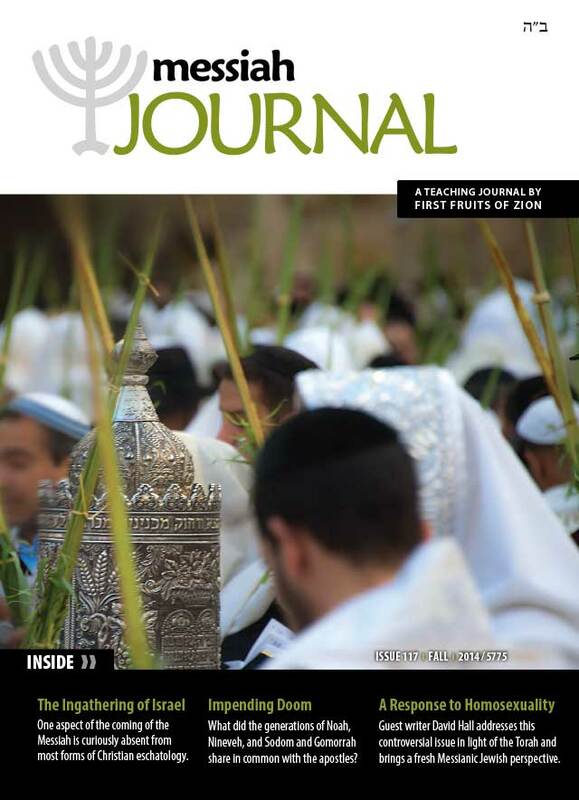 Guest writer David Hall addresses this controversial issue in light of the Torah and brings a fresh perspective. Boaz Michael reviews the last few months of a busy schedule reflects on the Messianic Jewish movement, and how best to define it. In this lenghty and in-depth article, Toby Janicki examines one aspect of the coming of the Messiah that is curiously absent from most forms of Christian eschatology. Biblical prophecies stipulate that at the time of the Messianic redemption, the Jewish people will be gathered back to their land. This concept is seldom taught in Christianity today. Instead, the prophecies that point to the ingathering are often spiritualized. Failing to understanding the concept of the ingathering of the exiles causes us to fail to understand one of the major roles of the Messiah. An Early Messianic Jewish Poem about the Messiah’s Relationship to Israel, by Chaim Yedidiah Theophilus Lucky. This poem was found in a collection of manuscripts that belonged to the Even Tzohar HaChasid [Rabbi Yechiel Tzvi Lichtenstein]. The manuscripts contain precious treasures—treasures of song and metaphor, treasures of research into the holy tongue, and treasures of the rabbi’s own research. What did the generations of Noah, Nineveh, and Sodom and Gomorrah share in common with the apostles? Aaron Eby investigates another aspect of the concept of redemption. While the “coming of the Son of Man” would seem to be a glorious and wonderful event, Yeshua spoke of it in foreboding and ominous terms. He depicts himself as a Noah type, prophetically warning about doom. In part two of this series, D. Thomas Lancaster further explores Jewish spirituality and the gifts of the Spirit. The kingdom of heaven bursts through into the current age in the form of spiritual gifts like healing, miracles, prophecy, and discernment. To understand these gifts and their proper role, we must first understand their context in Judaism and the first-century world. Special guest contributor David Hall opens a conversation about the Messianic Jewish response to homosexuality. An exciting new Vine of David biography about one of Messianic Judaism's founding fathers. Part 3: Bram: The Life and Wisdom of Messianic Jewish Pioneer Abram Poljak in His Own Words. The Miracles of Jesus and the Miracles of the Early Hebrew Prophets, by Rabbi Herbert M. Baumgard, published by KTAV. What is particularly intriguing about this book is that Rabbi Baumgard, a Reform rabbi, celebrated his ninety-fourth birthday this year. Rabbi Baumgard has some interesting advice in the final chapter of the book, entitled "Should Jews Read the New Testament?" Jude on Faith and the Destructive Influence of Heresy, by Rabbi Joshua Brumbach, published by WND Books. A Messianic Jewish commentary on the often neglected Epistle of Jude. His book is divided into two parts. Part 1 introduces the historical, cultural, and linguistic background to the epistle of Jude. Part 2 is a commentary on the epistle and includes an appendix of questions for group discussion.